Some great opportunities have come my way this year but to have a pattern published is such an honor. 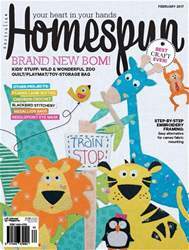 Almost a year ago I was contacted by Susan the editor of 'Homespun Magazine' to see if I would like to design a Doll for them.... this was so exciting for me. Much thought was needed to design something reasonably simple but still appealing. These are the 'Dolly Sisters', sweet simple little dolls with bright button eyes. I loved designing this doll, putting in sweet features that bring the face alive. The little headscarf with it's flowered trim, freckles anyone....just French knots, buttons for eyes and simple stitching gives her just the right look. The little skirt has a inserted border just to add interest, frilled sleeves and a petite collar just finishes her off. 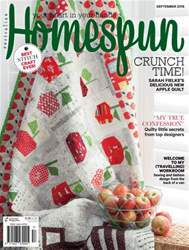 Homespun is a great Australian craft magazine with a pull out section containing all the patterns, it has a global feel with talented crafts people from around the world contributing to it's success. I do feel privileged to be part of this and I was truly ever so grateful to be asked. I do believe you can order it online from Zinio. Thanks friend, it has been a long wait to see them in print... some more in Homespun in Feb.